As I described in this post, the reported number of homicides in Chihuahua during 2009 turned out to be incomplete. Guess what? 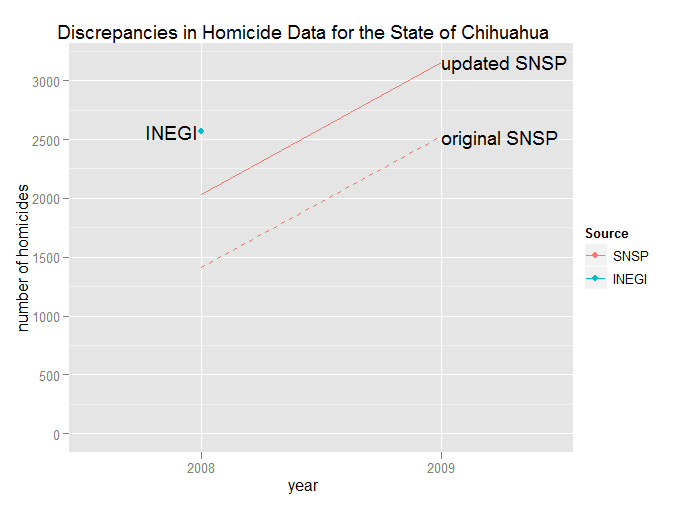 The SNSP just released [xls file] an updated version of the homicide data, and Chihuahua went from having 2,523 homicides to 3,156. My estimate was 3,256, so I came pretty close. And the homicide rate for the whole country was 15, exactly what I predicted. Score one for linear regression on World Statistics Day. Now we’ll just have to wait until the INEGI releases it’s numbers based on death certificates to see what the real number of homicide deaths was (3,600?). Since the SNSP conveniently forgot to mention that the first numbers it released in 2008 and 2009 were incomplete, and nothing like this had ever happened before, the official homicide statistics are turning into a real mess of incompatible numbers. For example, this report from the ICESI uses the original 2008 data, and this study by Mexico Evalúa and this story in The Economist use the original data from 2009.